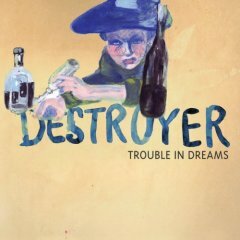 Destroyer‘s eighth album, Trouble in Dreams, could be the perfect album from the 70s that you never heard. Like John Darnielle‘s, Dan Bejar’s distinctive voice polarizes listeners; if you didn’t enjoy his previous album, Destroyer’s Rubies, you probably won’t like this one either, although the vocal acrobatics are less in evidence. But Bejar writes songs that are both listenable and interesting, both lyrically (inventive phrasing about time-honoured topics, like women) and musically, foregoing the traditional verse-chorus-verse structure, but still remaining – well, catchy is probably too strong a word – but certainly you’ll hear his songs in your head. This characteristic of his songwriting came home to me when I realized that, despite my devotion to the three-minute pop song, my favourite song on the album was the eight-minute long epic “Shooting Rockets (From the Desk of Night’s Ape). Bejar is widely compared to David Bowie, although I have to say that this album sounds more like early Roxy Music to me – in a good way, not in a boringly derivative way – especially “The State.” Trouble in Dreams definitely holds up to repeated listening and is worth checking out.